We will see if the US administration is really willing to accept such a change to the STCA given their overall anti-immigration rhetoric and policies. Why would the US do this favour for Canada as there is nothing in it for them? “If, for example, there was an agreement of the United States to accept back those people that are crossing at the end of Roxham Road (in Champlain, N.Y.), then Canadian officials … could theoretically take them back to a regular point of entry … and give effect to (the STCA) regulations at that place,” Blair said — i.e., would-be asylum-seekers actually apprehended crossing the border would be sent back. It’s clear enough heading into the election campaign that the Liberals want to be seen fighting irregular border crossers rather than managing them as the legitimate asylum-seekers they always insisted they were. Nevertheless, it’s clear enough heading into the election campaign that the Liberals want to be seen fighting irregular border crossers rather than managing them as the legitimate asylum-seekers they always insisted they were. The way to do the latter would be to spend scads more money hiring scads more people than they already have to adjudicate asylum claims as normal — only much, much quicker. That was what refugee advocates argued for nearly 20 years ago, when hundreds of people headed north for fear of a post-9/11 immigration crackdown. Refugee advocates lost the argument; the STCA, ratified under Jean Chrétien’s Liberal government, put an end to the northbound queues at border crossings; and most everyone in Canada instantly forgot those people ever existed. A significant political headache had been expertly healed. It’s both telling and appropriate, as Trudeau’s government rapidly abandons its touchy-feely schtick, that the Liberals would land again on a “get tough” approach at the border. Identity politics is practiced by all political parties, the variation lies more with respect to which identities they are trying to court compared to others. That being said, Selley notes correctly some of the risks. The latest drama surrounding Quebec’s efforts to cleanse parts of the civil service of ostentatious religious symbols — read: hijabs — concerns a fairly anodyne request for information: On Monday, La Presse reported that the provincial Ministry of Education had asked three Montreal-area school boards for statistics on the number of teachers and other employees who would be affected by such a prohibition. But much consternation ensued. “This … unacceptable intervention puts the government on the defensive before the parliamentary session even begins,” Bombardier complained. All this over counting the number of people to be affected by a proposed government policy? A valid criticism would be that only now, after 125 years of debate — or maybe it just feels that long — is anyone thinking to try to quantify the supposed problem that every party in the National Assembly has promised to address. Those who support the ban most fervently might credibly protest that the numbers are irrelevant: However many teachers, police officers and Crown attorneys there are who refuse to remove their religious symbols at work, that’s how many need to be removed from their jobs. (Bonus: Job opportunities for Proper Quebecers!) They see the CAQ government’s census as a sign it’s going soft and planning to adopt a “grandfather clause” that would exempt existing employees from the new restrictions — another very valid criticism, no matter what your position on the government’s policy. “Cowardice clause” would be even more apt. The political advantage is that no one would have to be seen losing her job — something of which polls consistently show Quebecers are leery, even if they support the restrictions in principle. But that’s just staggeringly disreputable: If this version of laïcité — the kind that, inter alia, keeps a crucifix hanging above the speaker’s chair in the National Assembly — is a social imperative, then why delay? Telling a Muslim girl she can’t be a teacher or a police officer because she was born too late might make less news than canning her mom, but it’s no less an affront to Quebecers’ basic freedoms. He shares that cognitive dissonance with many bien-pensant Quebecers. But for the love of Bonhomme, they’ve had more than a decade to square that circle — more than long enough, surely, to realize it simply can’t be done. If you don’t support telling certain Quebecers they can’t hold certain jobs in the public service — now and in the future — then you do not, in fact, support the Bouchard-Taylor recommendations, and you do not, in fact, support the CAQ government’s Bouchard-Taylor-Plus proposal. This isn’t a video-game simulation of Quebec society. Real people’s lives and livelihoods are on the table. At some point, if Premier Legault is to effect his more perfect Quebec society, the lists that are making people squeamish this week will have to be prepared: names, positions, salaries, offending religious symbols, termination dates. Quebecers who support these restrictions on religious liberty but aren’t sure they should affect real live human beings need to imagine themselves reading those lists, and then check their guts. ICYMI – Chris Selley: Police carding ought to be an anathema in a free society. How is it still up for debate? In the debate over if, when and how police should be able to stop, question and compel identification from citizens, and then store the information they receive in databases, those arguing to allow officers maximum discretion tend to defer to public safety. The more info police have, the more crime and violence and misery they can avert. Conveniently for that view, in the two years since more restrictive rules took effect in Ontario, Toronto has experienced a significant spike in homicides. Coincidence? Justice Michael Tulloch thinks so. In his 300-page report on the Independent Street Checks Review he oversaw, officially released Friday, Tulloch does a pretty good job busting causation down to correlation. In 2013, he observes, Toronto police agreed to ramp down “street checks” (an interaction producing “identifying information … concerning an individual … that is not part of an investigation”) and “carding” (when “a police officer randomly asks an individual to provide identifying information when there is no objectively suspicious activity,” and the individual isn’t suspected of or to have knowledge of any offence, and the information winds up stored in a database). Despite that, the city’s homicide count held steady at 57-59 per annum until 2016, when it spiked to 75. In 2017, the year the rules came fully into effect, the number dropped to 65, before soaring to 96 in 2018 — the highest in a decade. The number of shooting incidents, meanwhile, has hardly budged since the new rules came into force: There were 406 in 2016, 390 in 2017 and 424 in 2018. Furthermore, some areas of the city where carding was most prevalent — Jane and Finch, Rexdale, Lawrence Heights — saw dramatic decreases in shooting incidents. Whereas getting guns off the street is a common justification for intrusive police tactics, such as New York City’s stop-question-and-frisk, firearm seizures in Toronto skyrocketed after the new regulations came into place. And other Ontario municipalities reported no similar surges in crime. Overall, homicides in Ontario dropped from 2016 to 2017. The problems inherent in such a situation are myriad. There are quantifiable harms: People were denied jobs and security clearances, and in at least one case menaced by child services, thanks to information stored in police databases that implicated them in nothing other than being included in a police database. And there are more existential harms. Imagine growing up with a squeaky-clean nose yet constantly feeling like a person of police interest. It’s profoundly alienating, especially when targets quite logically conclude, based on well-documented statistics if not their own intuition, that they’re being harassed because of their race, skin colour or some other innate characteristic. It’s no less insidious if the bias is unconscious; it might even be more so. Tulloch has scores of recommendations, including clarifying what he argues are overly complex rules for officers; requiring officers to tell people when a conversation is voluntary; including written reasons for the existence of any database record; and destroying those records automatically after five years. Source: Chris Selley: Police carding ought to be an anathema in a free society. How is it still up for debate? A group of asylum seekers arrive at the temporary housing facilities at the border crossing Wednesday May 9, 2018 in St. Bernard-de-Lacolle, Que. My Policy Options article (Read Story) prompted more comment. I agree with Selley in his critique of the over-reaction by the Liberals and the NDP to the CPC policy resolution calling for an end to birthright citizenship and the reflexive labelling of the proposal as racist or xenophobic rather than a measured response. Last of my ‘catch-up’ series. In the decade following the first Canada’s World Survey (conducted early in 2008), the world experienced significant events that changed the complexity and direction of international affairs: beginning with the financial meltdown and ensuing great recession in much of the world, followed by the continued rise of Asia as an emerging economic and political centre of power, the expansion of global terrorism, increasing tensions with North Korea and risks of nuclear conflagration; and a growing anti-government populism in Western democracies. Despite such developments, Canadians’ orientation to many world issues and the role they see their country playing on the international stage have remained remarkably stable over the past decade. Whether it is their perception of top issues facing the world, concerns about global issues, or their views on the direction the world is heading, Canadians’ perspectives on what’s going on in the world have held largely steady. This consistency notwithstanding, Canadians have been sensitive to the ebb and flow of intenational events and global trends. 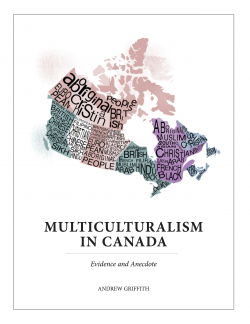 The very different pictures of how well integration is working for visible minority and immigrant women between Status of Women Canada (overly negative) and Immigration, Refugees and Citizenship Canada (not enough granularity between different visible minority groups, captured by Douglas Todd: Secret immigration report exposes ‘distortions’ about women . Todd continues with some of his interesting exploration immigration issues, including regarding different communities (Douglas Todd: Canadian Hindus struggling with Sikh activism) and highlighting the work of Eric Kaufmann (Douglas Todd: Reducing immigration to protect culture not seen as racist by most) who, in my view, overstates “white flight” and related ethno-cultural tensions and has an overly static view of society. From a genetic point of view, all humans are remarkably similar. Indeed, when the Human Genome Project was completed in 2003, it was confirmed that the “3 billion base pairs of genetic letters in humans [are] 99.9 percent identical in every person.” There are, of course, genetic differences that occur more frequently in certain populations — lactose intolerance, for example, is more common in people from East Asia. But there is simply no reason to think that your genes tell you something significant about your cultural heritage. There isn’t a lederhosen gene. More important, we shouldn’t forget that the concept of “race” is a biological fiction. The crude racial categories that we use today — black, white, Asian, etc. — were first formulated in 1735 by the Swedish scientist and master classifier, Carl Linnaeus. While his categories have remained remarkable resilient to scientific debunking, there is almost universal agreement within the science community that they are biologically meaningless. They are, as is often stated, social constructs. Other research has found that an emphasis on genetic difference has the potential to (no surprise here) increase the likelihood of racist perspectives and decrease the perceived acceptability of policies aimed at addressing prejudice. Some less-than-progressively-minded groups have already turned to ancestry testing as a way to prove their racial purity. White supremacists in the United States, for example, have embraced these services — often with ironic and pretty hilarious results (surprise, you’re not of pure “Aryan stock”!). But I am sure most of the people who use ancestry companies are not thinking about racial purity, the reification of race or antiracism policies when they order their tests. And I understand that these tests are, for the vast majority of customers, providing what is essentially a bit of recreational science. In fact, I’ve had my ancestry mapped by 23andMe (I am, if you believe the results, almost 100 percent Irish — hence my love of Guinness). It was a fun process. Still, as the research suggests, the messaging surrounding this industry has the potential to facilitate the spread and perpetuation of scientifically inaccurate and socially harmful ideas about difference. In this era of heightened nationalism and populist exceptionalism, this seems the last thing we need right now. Lack of diversity in highlighted is sectors as varied as entertainment (The Billion-Dollar Romance Fiction Industry Has A Diversity Problem) and education (Lack of diversity persists among teaching staff at Canadian universities, colleges, report finds). Chris Selley: Granting Sikh bikers ‘right’ to ride without helmets only adds to religious freedom confusion provides a good critical take on whether religious freedom extends to riding motorcycles (Ontario does not allow, British Columbia and Alberta do). “I don’t know of any other archival collections that are like this,” she said. “They might exist, but I don’t know of any. The combination of young people’s letters and letters to a non-Japanese Canadian person is just incredible to me. This is really special. And a variety of interesting articles on Islam and Muslims: Why so many Turks are losing faith in Islam, Can Muslim Feminism Find a Third Way? Ursula Lindsey and Gender parity in Muslim-majority countries: all is not bleak: Sheema Khan. “Like Americans in many other religious groups, a substantial share of adults who were raised Muslim no longer identify as members of the faith. But, unlike some other faiths, Islam gains about as many converts as it loses. How does this compare to people who converted to Islam? “Among those who have converted to Islam, a majority come from a Christian background. In fact, about half of all converts to Islam (53%) identified as Protestant before converting; another 20% were Catholic. And roughly one-in-five (19%) volunteered that they had no religion before converting to Islam, while smaller shares switched from Orthodox Christianity, Buddhism, Judaism or some other religion. Good column by Selley. Love the first para on the party differences. When Conservative Canadian governments deport failed asylum-seekers and try to prevent them from arriving in the first place, they tend to boast about it. When Liberal Canadian governments deport failed asylum-seekers and try to prevent them from arriving in the first place, they tend to pretend it’s simply not happening. On migration policy, this is one of the key differences between our two natural governing parties. It basically boils down to branding. In a press conference on Wednesday, Conservative immigration critic Michelle Rempel tried to frame the northbound exodus as a direct result of Trudeau’s shameless virtue signalling. Asked what her government had done or would do differently, she responded, essentially, that her government wouldn’t have all-but-explicitly encouraged people to give Canada a college try. It’s a stretch; this is mostly about circumstances beyond any government’s control. But the extent to which this government refuses to speak in plain English is truly remarkable. On Sunday, in a visit to the border region in Quebec, Transport Minister Marc Garneau said Canadian consulates in the U.S. would try to warn people thinking of heading north to claim asylum that their chances of success were far from assured. That’s a very good idea. Many of the current border-crossers are Haitians whose asylum claims failed in the United States. A temporary post-earthquake moratorium on removals having expired, they now face deportation. Reports suggest they are being sold garbage advice — in some cases literally — that Canada is a sure thing. To preserve Canada’s already stretched border resources, to maintain whatever public trust remains in the system’s integrity, and to save vulnerable people from extortion and financial ruin, the government should be warning people away in no uncertain terms. For the love of God, man, there is no “proper procedure” with a snowball’s chance in Port-au-Prince via which a failed Haitian asylum-seeker in the United States can come “properly” to Canada. What you mean is “don’t come. We’ll probably deport you anyway.” So say it. There’s no guarantee a blunt message would get the job done, mind you. No matter how often the Conservatives called asylum-seekers from European Union countries “bogus refugees,” the Immigration and Refugee Board kept recognizing their claims at a reasonable clip — 2,500 from Hungary alone over the last decade, for a roughly 18 per cent success rate. If my options were (a) deportation to Haiti, where I have nothing, or (b) a $200 trip to the border, a longish stay in Canada during which I can legally work and make some money, a long-shot chance at permanent residency and then, at worst, deportation to Haiti anyway, I know exactly which one I would pick. What can the government do about this? Without straying dramatically from traditional policy options, not a hell of a lot. But it could stray from traditional Liberal policy and not let a massive backlog build up. On Wednesday, citing a UNHCR official, Global News reported asylum-seekers arriving today won’t even get preliminary eligibility hearings until January. The longer a hopeless claim takes to be resolved, the greater the incentive to give it a whirl. The government could hire more people to deal with these claimants expeditiously, which the Liberals have said they will, thus reducing that incentive. But most radically, as off-brand as it would be, the Liberals might consider saying what they bloody well mean. Brits are reacting to the latest terrorist attacks on their soil more or less as usual, though Thursday’s election adds an extra bit of urgency and drama. Conservatives, including Prime Minister Theresa May, are calling for ramped up anti-terror measures: more surveillance, more punishment, more online censorship. “Enough is enough,” May said Sunday. A few unreconstructed lefties still bang on about Western civilization’s just desserts, but as Terry Glavin observed in the National Post after last month’s attack in Manchester, that species of urban sophisticate is less welcome at parties than ever. Labour leader Jeremy Corbyn used to be very much of the “Terrorist? Or freedom fighter?” set. With Labour shockingly competitive in the polls, he now accuses May of cheaping out on policing and supports a “shoot to kill” policy that he used to oppose. Some are calling for much stronger measures indeed. Tarique Ghaffur, a former assistant commissioner for London’s Metropolitan Police, argues “special centres” should be set up where some 3,000 known Islamic extremists could be forcibly de-radicalized — i.e., internment camps. Professionally hysterical Daily Mail columnist Katie Hopkins, who is very un-British-ly proud of being frightened to death, is foursquare behind the idea (though she has apologized for her post-Manchester demand for a “final solution”). One rather suspects they would not. And the problem in Ireland was quite a bit larger than hunger strikes. Setting aside civil liberties and other such malarkey, it didn’t work: 1972 was the deadliest year of the Troubles. With all those suspected threats locked up, the IRA blew up pubs, hotels and army barracks across the U.K.
That took gumption and significant resources. Nowadays, it would take very little effort at all for ISIL to leverage internment as powerful inspiration for amateur jihadists who see glorious carnage to be made with a white van and kitchen knives. Internment is a God-awful idea, but it’s at least understandable in the British context. Terrorism is hardly an existential or an unprecedented one: 2005 was the deadliest year for terrorism in the U.K. since the Troubles, and it pales by comparison. But when cars and kitchen knives become threats, the cowardly have all the more reason to hide under their beds and demand martial law so they can be comfortable going to the theatre again. It’s quite ridiculous to see this nonsense crop up here in Canada, however, where the domestic death toll from Islamic terrorism stands at three people, all of them soldiers. “All people (who are) on terror watch list in Canada or are in terrorist rehab programs should be detained and in some cases deported,” Toronto Sun columnist Joe Warmington tweeted. His colleague Anthony Furey followed suit: “Get the RCMP to arrest the dozens of known jihadists now walking around freely on Canadian soil. Just do it.” Furey’s demand was all the stranger considering he wrote a column explaining how implausible it would be to build a legal case against someone for his activities in ISIL-controlled Iraq or Syria. Sheltered as Canadians have been from these threats, there is a streak of performative unseriousness that runs through our anti-terrorism discussion. “Let ‘em go,” some chortled when Canadians were found to be heading abroad to fight for ISIL. And when they come back, what then? “Lock ‘em up,” they’ll say — but of course we can’t, or not while respecting the rule of law. The Brits, by and large, went out as they planned. Overwhelmingly, Canadians seem to be doing likewise — and rightly so. The rest of us should get with the program.